. Unfortunately, many separate listings can make it hard for webmasters to understand the full picture of how Google “sees” their domain as a whole. To make this easier, today we're announcing "domain properties" in Search Console, a way of verifying and seeing the data from Google Search for a whole domain. Domain properties show data for all URLs under the domain name, including all protocols, subdomains, and paths. They give you a complete view of your website across Search Console, reducing the need to manually combine data. So regardless of whether you use m-dot URLs for mobile pages, or are (finally) getting the migration to HTTPS set up, Search Console will be able to help with a complete view of your site's data with regards to how Google Search sees it. 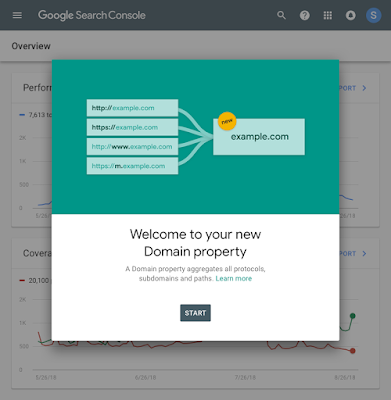 If you already have DNS verification set up, Search Console will automatically create new domain properties for you over the next few weeks, with data over all reports. Otherwise, to add a new domain property, go to the property selector, add a new domain property, and use DNS verification.We recommend using domain properties where possible going forward. Domain properties were built based on your feedback; thank you again for everything you've sent our way over the years! We hope this makes it easier to manage your site, and to get a complete overview without having to manually combine data. Should you have any questions, feel free to drop by our help forums, or leave us a comment on Twitter. And as always, you can also use the feedback feature built in to Search Console as well. Google recommends verifying all versions of a website -- http, https, www, and non-www -- in order to get the most comprehensive view of your site in Google Search Console. Unfortunately, many separate listings can make it hard for webmasters to understand the full picture of how Google “sees” their domain as a whole. To make this easier, today we're announcing "domain properties" in Search Console, a way of verifying and seeing the data from Google Search for a whole domain.